Hi I have virtual box (5.2.8 r121009 ) installed on my host windows 10. 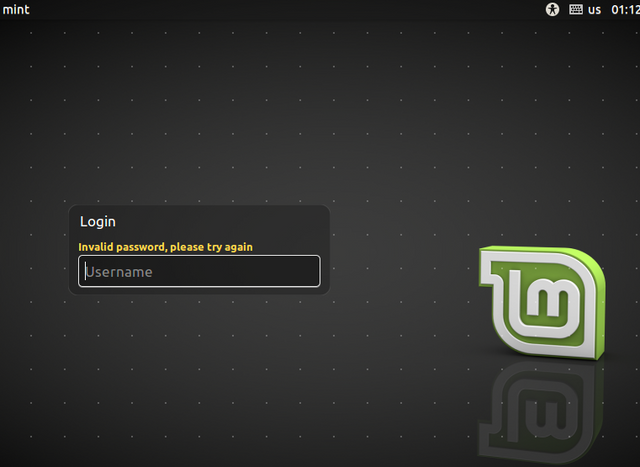 I installed linux mint 18.3 as a guest OS. I cannot log in with my username/password. I have tried this at work and at home several times. It keeps telling me "invalid password, please try again". I make sure I am not using caplocks. I have reinstalled several times and just cannot get this to work. I do not know what the issue is. I have installed 18.3 under vmware as a host and all runs fine. Does anyone know if virtualbox has issues? Thanks. Last edited by sarahc on Tue Apr 17, 2018 12:10 am, edited 1 time in total. No, such an issue is not known. If you are in the login screen, do not type the user name, but select the account using the up arrow key. This eliminates the question, whether the user name or the password gives the issue. If this still does not work press in the login screen host-F1. This brings you into the virtual console of the guest. Try to login there. Note, that in the virtual console there is no feedback for the password, you have to type it blindly and press the Enter key afterwards. To leave the virtual console press at first ctrl-d, afterwards alt-left. Do you possibly use special signs in the password? They may possibly be in the installed system on different physical keys than in the live system, where you defined the password. State 2: If I don't select anything from the dialog box presented in State 1, after a while it transitions to an alternate login screen on its own accord, where it doesn't show my full name, but rather it just says "Login" and asks for my username, and then my password. It then tells me i have an invalid password, and to try again (as shown below). Note: I missed seeing the dialog box in State 1, as I let the install run, while I was doing other things; and when I looked back at the screen it was in state 2. I am confused why it lets me log in via state 1 after pressing 'restart now', but not state 2. I don't understand what the difference is in the two login screens. Is it possible there is a space in your user name? If so, I would avoid embedded space in user name. Just a guess! I try to reproduce the situation, but I cannot, because I never get what you showed in the second picture. So I have to ask: What does "after a while" mean exactly? I have my virtual machine with 18.3 with the login screen open since about 10 minutes, but nothing changes here (no state 2). For the moment I can only look at your picture and do some assumptions. Following that you need at first to enter your username. Is our username "Login"? In this case enter the username with a small L (= l). What is the result in the virtual console? Special signs in the password don't seem to be the cause of the problem, because otherwise in state 1 it would give the same problem. Is it possible there is a space in your user name? To make this short: this is impossible The real (or technical) username can have no space. E. G. if the OP would have entered as her name during installation "Sarah c", the installer would automatically had made out of it "sarahc". Is the second image the screen locker? And with "mint" in the upper left corner, isn't that from the Live iso? This does not look like a screen locker, but your other suspicion, that this might be the live system, makes sense. In this case your advice for login in will work. In this case it means also, that the installation media has not been removed from the virtual machine. Did you install directly from a ISO-file or from a DVD in your physical drive? Hi everyone. Thanks so much for all your time and help thus far. I managed to sort out what was going on. What happened was that during the install process, I placed virtualbox in the background while I was searching the web. It seems that doing that resulted in the session timing out after a few minutes and going to the login screen as shown in the state2 image. Originally I thought the install had finished and was asking me to login. 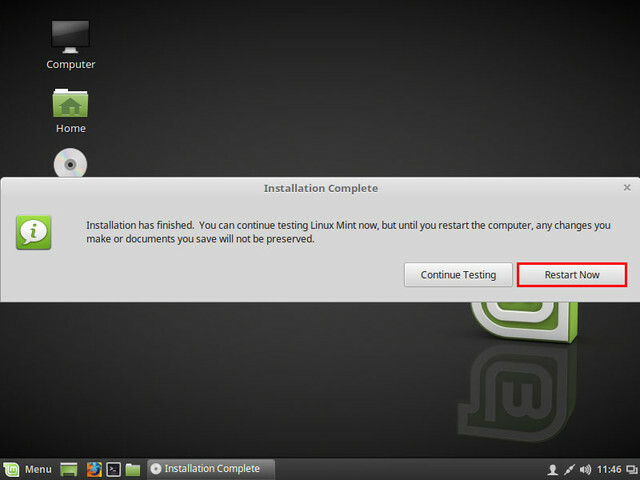 However upon further testing I found that this really is some kind of 'screen saver' state, because when I typed in the username = mint and password= <empty> (as suggested by MrEen which I didn't know about before), I found that linux mint was still in its install phase. I then waited for it to reach the end of the install where it shows that dialog box asking me to 'restart now', or continue testing (i.e. as shown in state1 image). I again tested placing the virtualbox session in the background, and yet again it went to the login screen as shown in state2, where i need the username=mint, p/w=<empty> to login with.